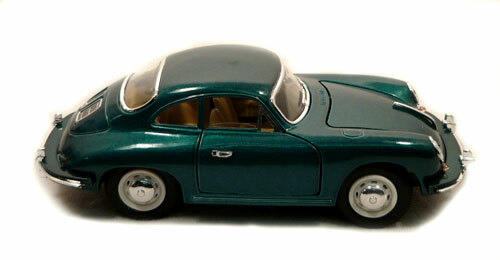 This is a 1961 Porsche 356B Coupe 1:24th Scale By Superior/Sunnyside Collectible. This heavy gauge Die Cast has a working Steering wheel that turns the front wheels from left to right. The hood opens to a trunk with a spare tire in it. The doors open to a tan interior with a black steering wheel that has a smaller chrome steering wheel inside. It comes with chrome hub caps, white wheels and black wall tires. This free wheeling model has chrome air vents in the trunk. = 7" Long x 2.75" Wide x 2" High.